Stunning ceiling from Allison + Matt’s home tour on Apartment Therapy. For a high impact, yet cost effective update to a special area in your home, try installing an ornamental ceiling medallion. 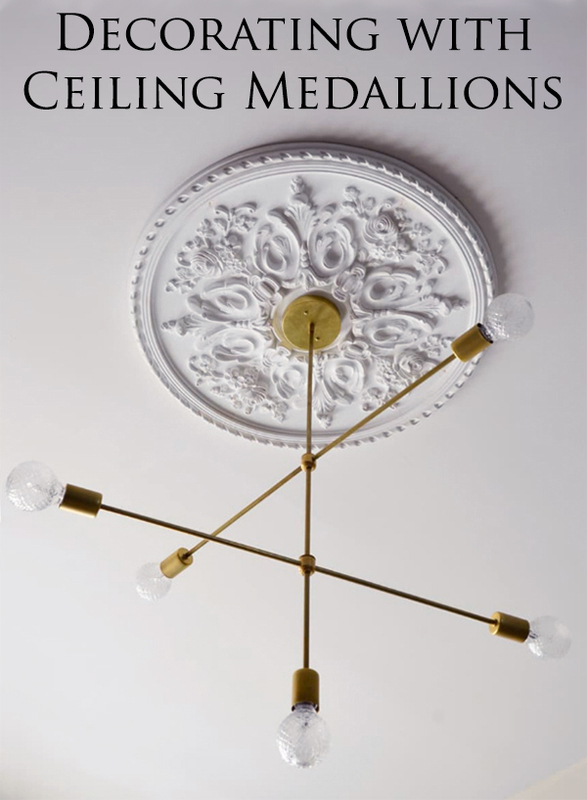 A ceiling medallion can be the perfect accent for a unique chandelier and will work well with most light fixtures. I really love the romance and architectural feel that ornate medallions add to a room, so I’ve rounded up my favorite interiors showcasing this gorgeous ceiling feature to share with you here. London residence designed by Cochrane Designs. After a day of research and viewing tons of stunning ceilings, it seems that it’s hard to go wrong when decorating with a ceiling medallion. All of the rooms I’ve come across with this architectural feature have been spot on! For example, I love how regal this master bathroom looks with its intricate ceiling medallion and oversized tufted pouf. These are just the kind of details that begin to make your home feel a little more like a vacation destination. And if you’re new to this architectural feature you’ll be glad to know that installing a ceiling medallion is rather simple. The most detail oriented part is cutting a proper sized hole in the center of the medallion to install you light fixture through (although some will already have a cut-out for your light fixture when you purchase it). Here is a great tutorial on how to install a ceiling medallion in detail. 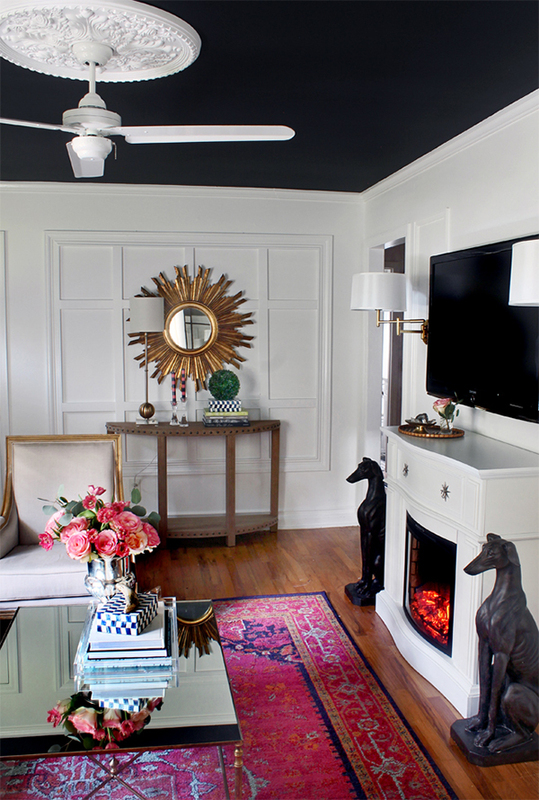 Ceiling fan + medallion combination by Kristin Jackson. 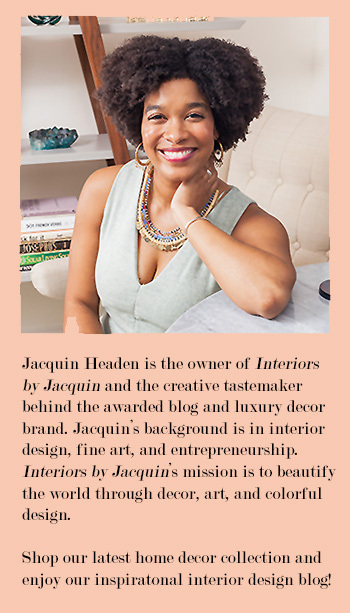 On another note, I’ve never seen a ceiling medallion paired well with a ceiling fan, so the bedroom design above from designer Kristin Jackson was quite exciting. This interior design serves as proof that a ceiling medallion is still completely possible even if your room has a ceiling fan. Just make sure that the style of your ceiling fan and medallion do not clash aesthetically. Closet door DIY tutorial from One Kings Lane. Lastly, don’t forget that you can even beautify smaller spaces like bathrooms, hallways, and office spaces with ornamental medallions. For a twist on the traditional ceiling medallion, take a look at One Kings Lane’s recent DIY where they upgrade closet doors using circular medallions. 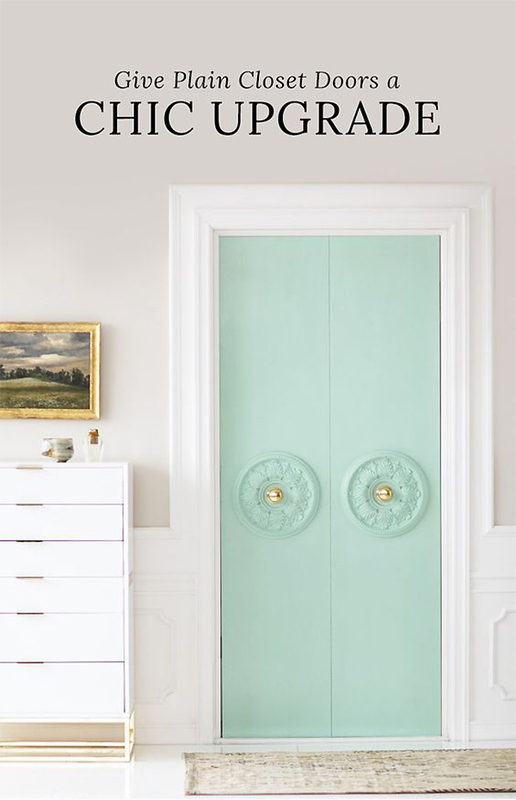 I am loving the feminine, European touch that these luxe doors give the room! 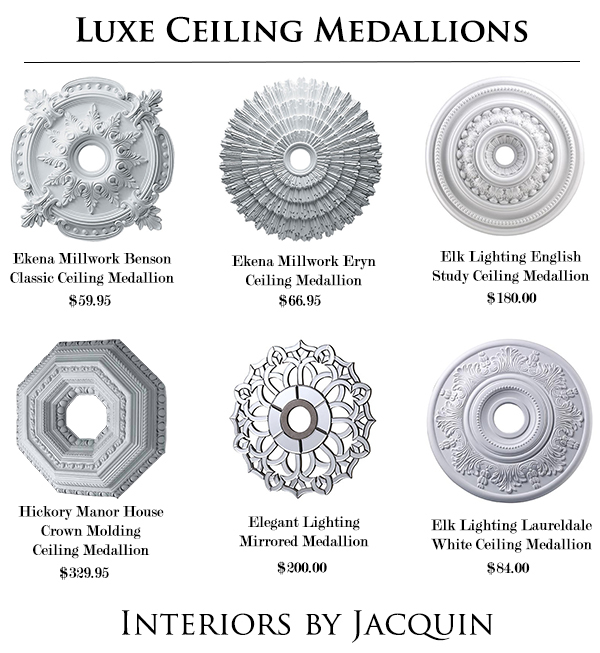 All of these rooms showcasing stunning medallions peaked my interest so I went on the hunt to source the perfect ceiling medallions online. Here are a few majorly chic medallions to consider for your home. This architectural feature is perfect for introducing instant luxury to your space!